The Beacon Museum in Whitehaven is working with AWAZ Cumbria to host the Challenging Prejudice exhibition, which launches on September 30. Ahead of the launch, AWAZ has been delivering workshops in Hensingham and St Mary’s Schools, Whitehaven. Both schools were invited to enter a creative competition, and the 161 entries it has attracted will form the basis of the upcoming exhibition. 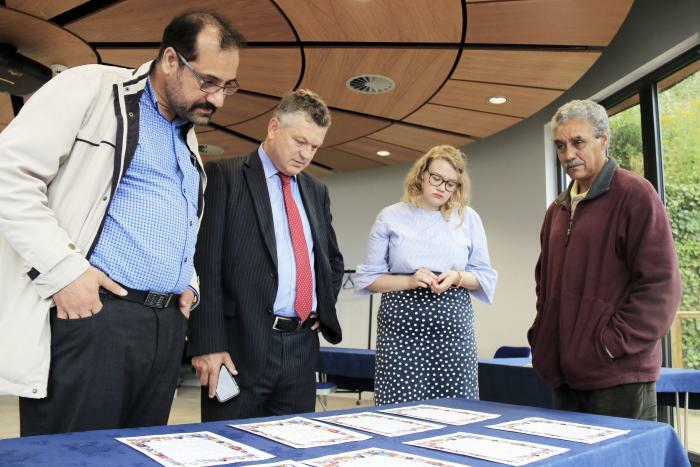 Judging the entries, including short stories, poetry and pictures on the topic ‘Uniting Communities: Challenging Prejudice’, have been Peter Foley MBE, Aftab Khan from AWAZ Cumbria, Copeland Mayor Mike Starkie and Nicola Lawson, assistant curator at The Beacon. Nicola said: “All of the entries we received for this competition were thoughtful and empathetic. “We thank everyone who took part and engaged so thoroughly with the issues of tackling prejudice and celebrating diversity. “Having seen the entries, we are so excited to start work on our exhibition and share the students’ excellent work with all of the museum’s visitors. The winning pupils will be awarded their prizes at the opening of the exhibition on September 30. Challenging Prejudice runs at The Beacon until November 5.